Since 27 January 2007 G Christian Larsen has conducted extensive research on the former Pennfield Ridge Air Station. 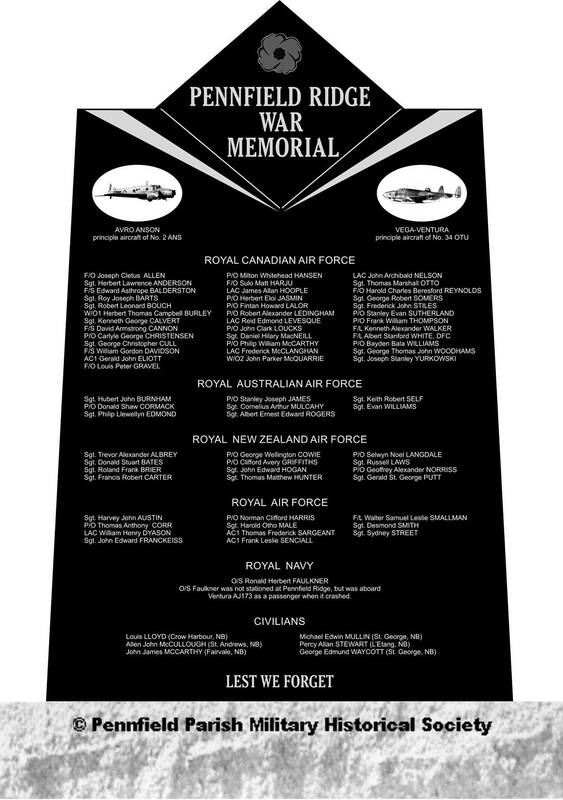 From this research a "Roll of Honour" has been established which identifies seventy (70) service personnel (69 airmen and 1 British seaman who was a passenger aboard an aircraft when it crashed) and six (6) civilians who were killed during the history of the former Air Station. With the "Roll of Honour" now complete Pennfield Parish Military Historical Society has decided to continue forward the work of the "Charlotte County War Memorial Committee (2005)". Their remaining goal was erecting a stone listing those killed along with a three-tier flag pole at the memorial site located along Route 1. The flags which will be flown are the Canadian and New Brunswick flags along with the RCAF Roundel. P/O Williams (author of the above noted poem) was the sixteenth airmen killed at Pennfield Ridge and was among the numerous young aircrew students killed in training crashes across Canada during World War II. They all died in the service of their country while preparing for war and yet they remain forgotten heroes. They remain so simply because they died before their finest hour. We need to remember these forgotten heroes. So many unfilled dreams of a brighter tomorrow ended before they really had a chance to begin. Sometimes the youthful exuberance of the innocent and an uncertainty of a tomorrow often exacted a high toll on those who answered the call of duty. 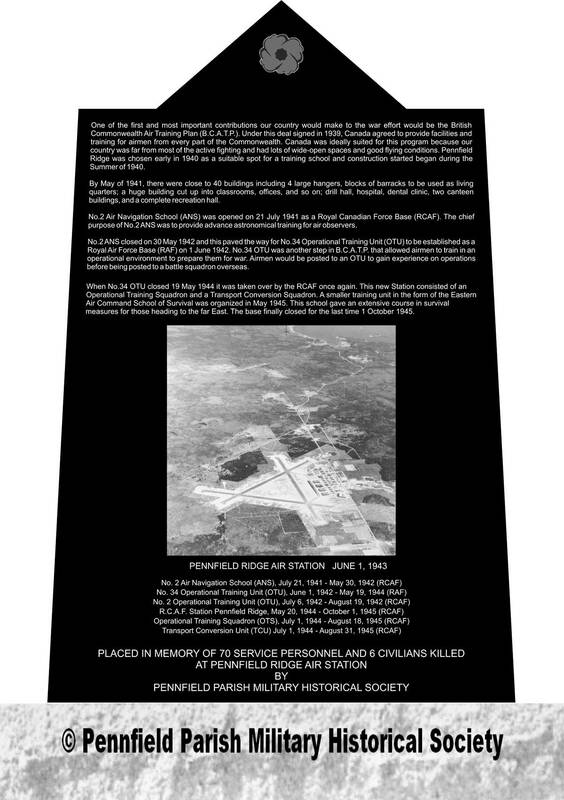 We need to remember ALL those who served and/or worked at the Pennfield Ridge Air Station. The society feels this is an important goal and have been working with Smet Monuments to design a memorial stone. The purposed monument will be dark black granite (polished on two sides with rough edges) sitting on a gray base. The overall size of the monument is scaled at 48"x8"x72" sitting on a 10" high base. A committee of two, G Christian Larsen and Sheri L. Burhoe, has been formed to raise the $12,000 needed to cover the cost of the memorial stone and flag pole. Smet Monuments will include all laser lettering and images (as shown above), the concrete foundation work and the installation.